Pots & Pans & Phailures – OOPS! I found a new flavor of Hershey Kisses…oh my, wait just a minute…I must run downstairs and grab a few before I continue writing this post, or I will be so totally distracted by craving them, I won’t make any sense at all…does that make sense??? I’m laughing…and also in reality…getting up…and finding some Hershey Kisses! Okay, now that I am eating my “Mint Truffle” and “Cherry Cordial” Hershey kisses I can go on with the posting. A week or so ago I found these delicious nougats of joy in my grocery store. I’ve seen beautiful cookies created with plain kisses, I immediately imagined amazing cookie possibilities concocted with these new flavors. I found a recipe online, softened my butter, gathered ingredients, mixed it all up, baked…and tasted…and grimaced! The cookies were horrible. I was so glad the kisses were saved until after baking, at least they weren’t wasted. OOPS! I was going to throw the cookies out, but thought twice, and froze them in a ziplock bag to feed the birds and squirrels. At least the back yard squirrels appreciated my attempt at a cookie masterpiece. Another good use for cookies that are not up to par is grinding them down and using them as the crust for cheesecakes and other pies. I used my food processor and reduced about six cookies to crumbs, added two melted tablespoons of butter, and pressed this in the bottom of cupcake liners in a muffin tin. I baked this for five minutes in a 325 degree oven. When they cooled down they hardened up into perfect little crusts for my mini cheesecakes. The recipe is below. Oreo halves or vanilla wafers are also options for the crusts. Any topping desired: fruits, jam, melted chocolate, sour cream, etc. Oven preheated to 325 degrees. Use cupcake liners in muffin/cupcake pan. Vanilla Wafers or scraped Oreo halves can be placed in bottom of liner. Another option is using 6 cookies (such as my disappointing recipe) and grind them in a food processor until they are crumbs. 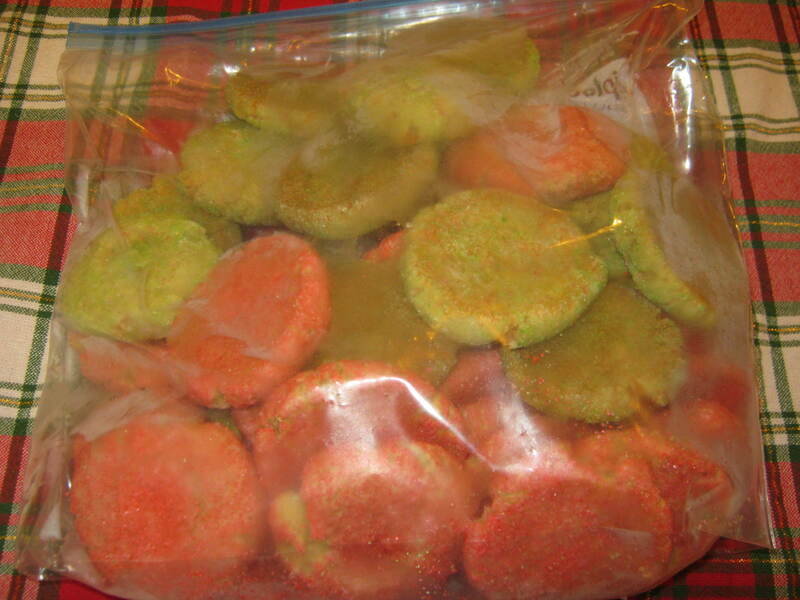 Mix with 2 tbs melted butter and press in liners, bake for about five minutes to harden. Beat with mixer, cream cheese, vanilla and sugar until smooth. Add eggs and mix until blended. Fill each cup to about 3/4 full. Bake 25 minutes, or until no longer jiggly in middle. When cool, remove from pan and place in refrigerator until cold. 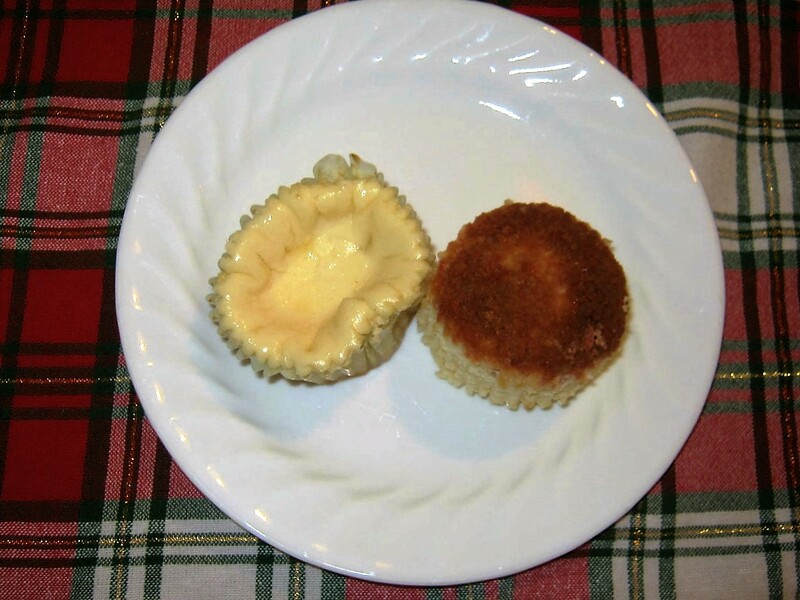 The mini cheesecakes are super-easy and delicious. Well, I am reeling here, they have hershey’s kisses in these flavors? And then of course, squirrels eat good stuff, so the cookies couldn’t really be horrible. I told you my mind is reeling from this post. So of course you didn’t give all the cookies to the tasteful squirrels. You made these delicious things into pie-crust. Now I am fully with you. Can I have one of those mini-cheese cakes? 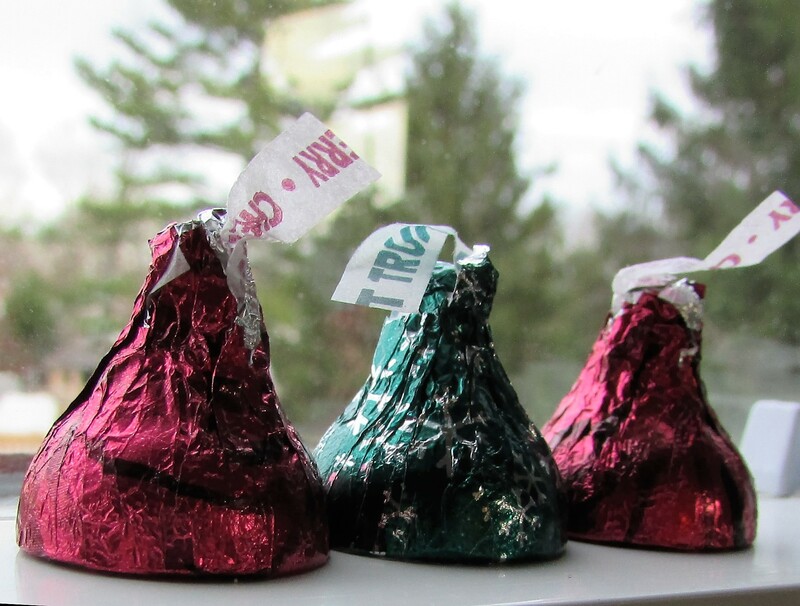 Yes, the kisses really come in those flavors and they are amazing. The centers seem slightly softer than the outside, and even better, they are really reasonable in price and on sale quite often at this time of year. The cookies…they tasted of raw flour for some reason. They were great though for making the crusts for the cheesecakes. The squirrels are cute, I give them bread ends too, and that seems to keep them away from the bird feeders for a few hours. I have squirrel proof feeders, but they have managed to figure out how to defeat one of them. They hang by their toes like bats and then carefully reach up and steal a seed. It’s comical. Thanks for the comment. I notice one thing about Americans- they do love experimenting with their food. The flavours of Hershey’s , potato wafers, candy, icecream- all stand testimony to this. I am amazed every time I read about a new flavour of something. I was reminded of this old American habit when I read your post. And another thing, I got the aha moment too, when I read the title of your post- you had three p’s there- and that is why your blog name is threepsandq, right ? 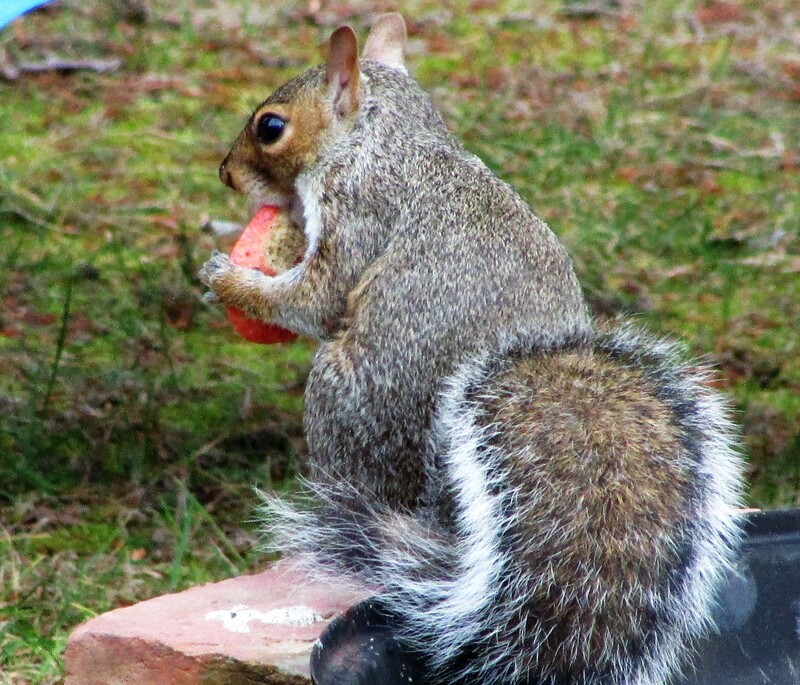 I am glad the cold squirrels and birds got a hot treat from their old friend. I got a smiley treat from my friend through this post too. Hi Susie, Yes, I only use P’s or Q’s as my title words. This often means making an F sound too out of the PH…I’m smiling over your AHA moment. It made me happy! I was glad he appreciated the cookie…they were really terrible. Thanks for stopping by the blog and the comment.